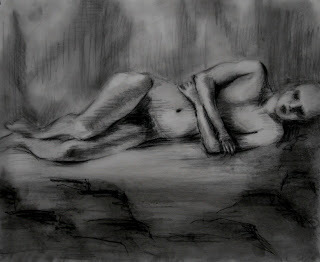 Last weeks life model had some unusual body language which made for a change. I decided to do two versions of the long pose rather than deal with the unavoidable adjustments after the break. I didnt finish the second one but looking at it today I decided it had Halloween potential so I spooked it up a bit. ....and updated just for fun - inspired by Jonny Lee Millers version of Frankenstein's creature which was on at the National Theatre earlier this year.